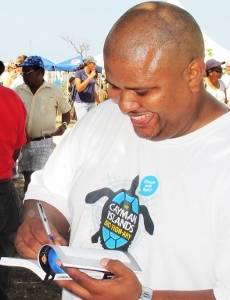 (CNS): A dictionary designed to preserve Cayman’s own unique linguistic heritage alive was selling like hotcakes at the recent agricultural show but it is now available in shops across all three islands, its publisher has said. Although in the first place an entertaining read which examines the local dialect the author Kevin Goring (left) says its publication is part of a wider goal to promote Caymanian culture and heritage. Goring began collecting Caymanian words out of passion and curiosity some 12 years ago the dictionary is the first in a line of products that he hopes will fuel a cultural movement. Featuring more than 1,000 words used in the Caymanian dialect, the dictionary is the first in a line of products under ‘The ‘Caymanology Collection’ brand. According to goring it is based on a philosophy that “all things Caymanian should be studied, preserved and promoted,” Caymanology is a movement towards heightened cultural awareness and native pride, he said that he hopes to expand throughout 2012. At the request of severaleducators, Goring also hopes to meet with various schools and training centers in the coming months to promote the Dictionary and the Caymanology movement to students of all ages. The Cayman Islands Dictionary is now available from supermarkets and other authorized retailers.